Those of you in the know would have no doubt already heard of Ellis Faas and are probably already using her products. If you’ve never heard of this name, well, it’s still not too late. 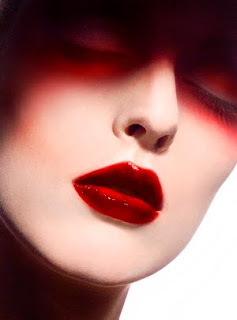 Ellis Faas is a Dutch makeup artist extraordinaire who has had an extensive career working with just about every who’s who in the fashion and beauty industry. Think Mario Testino and Michelangelo di Battista, Karl Lagerfeld and Jean-Paul Gaultier. Her impressive portfolio also includes work for fashion magazines like Vogue and Harper’s Bazaar and ad campaigns for MAC, Chanel and the memorable Trésor with Kate Winslet.....just to name a few. Ms Faas has had training in both professional photography and makeup, in particular in the area of special effects, in Amsterdam and Paris. She worked in London for several years, doing makeup for music videos and also for medical inserts recreating skin diseases using her talent and training in special effects. Upon her return to Amsterdam, she ran a successful portrait studio in which she put her talent in both makeup and photography to full use. A major career breakthrough came one day in the form of Mario Testino. As fate would have it, Testino handpicked her to be his makeup artist when he came to Amsterdam for his photo shoot for L’Uomo Vogue. This collaboration turned out to be the first of many collaborations with Testino. One thing led to another and she was soon introduced to Karl Lagerfeld who made Ms Faas the chef de cabine for his Fendi fashion show. She suddenly found herself in charge of the makeup for 60 models. Needless to say, her career went from strength to strength thereafter. For a long time already, Ms Faas had been experimenting a great deal with creating colours and concocting makeup formulae in her kitchen. Thanks to her background in special effects makeup, Ms Faas came upon the concept of creating makeup using colours that we see in the human body. Just when you thought that the beauty industry might have run out of truly original ideas to keep us ladies enchanted, along comes Ellis Faas with the Human Colours concept. Everything that exists in the human body – anything from blood and veins to freckles and bruises and even the ear and the palm of your hand – has been used as inspiration to create the shades for her makeup line. Ms Faas’ point of view is that because such colours already exist in the human body, these very same colours as makeup would also always suit people of all ages and skin tones. Colours that will never be out-of-date or out-of-fashion – Ms Faas doesn’t believe in coming out with different colours every season. In February this year, she launched the first phase of her high-end Human Colours makeup with a line of lip products called ELLIS LIPS. ELLIS LIPS is available in three textures – Creamy, Milky and Glazed. There are a total of 27 lip shades to choose from but her pièce de résistance has to be her ELLIS RED (right), a true blood-red lip colour that is available in all three textures. 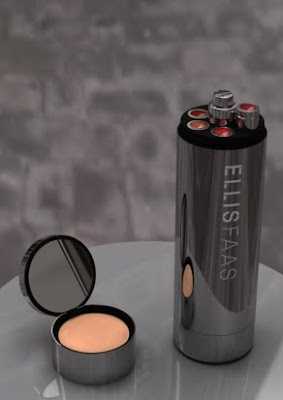 Early this month, Ms Faas launched the second phase of her line with ELLIS EYES (eyeshadows, mascaras and eyeliners) and ELLIS SKIN (foundations, concealers and blushes). There is still more to come in the future. What’s unique about ELLIS FAAS products is that they are all in liquid form (with the exception of a powder foundation) and are packaged in very sleek silver bullet-shaped pens. Sleek at its very ultimate, if you ask me. The pen’s design was the result of a collaboration between Ms Faas and industrial designer Arnout Visser. Due to this uncomplicated shape, the display area for ELLIS FAAS products always looks distinctive, neat and streamlined. It beckons you to take a closer look because it’s so different from the rest of the pack. 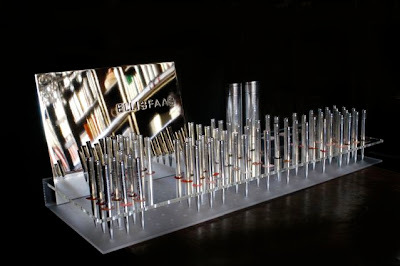 One would be forgiven for even thinking it is a display rack for gleaming luxury fountain pens! Ms Faas has also come up with an ELLIS HOLDER which is like a canister in which you can store several ELLIS FAAS products. There is space to insert the different pens for the foundation and a combination of the eye/lip/cheek products. As you will see in the image below, in the cover, there is space for the powder foundation and a mirror too. This is way too cool. The ELLIS HOLDER certainly wouldn't look out of place in the hand of some vain makeup-lovin’ android in a sci-fi movie. The ELLIS FAAS website is certainly worth a visit as it is chock full of information. On the homepage, you would be welcomed with soothing piano music beautifully played (and composed) by Ms Faas’ own daughter, Flavia. Look carefully at the background of the webpage. The healthy pink that you see is an image of human skin! Very appropriate for the Human Colours concept, I must say. Explore further and you will find that the swatches for her products are not flat one-dimensional and usually inaccurate colours. Instead you will find the various colours of ELLIS LIPS on real pouty lips and those of ELLIS EYES on real eyelids. As if that wasn’t enough, ELLIS LIPS can also be viewed with three skin tones – Caucasian, brown and Asian. Given her professional background, it was only logical that Ms Faas did the makeup for these models and shot the visuals herself. By the way, I was amused when I read that ELLIS FAAS got asked so often if they tested on animals (which they don’t) that they decided to patent their witty slogan: Only Tested on Supermodels. In the Netherlands, ELLIS FAAS is available at Skins Cosmetics. 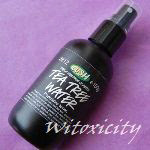 Please check the website to find out if the products are already available where you are. If they are not yet available in your country, don't fret as ELLIS FAAS has an online shop which also ships internationally. I purchased a couple of ELLIS FAAS products last week. Resistance was, oh, futile. Why keep lemming if the products were within arm’s reach, eh? More on that very soon. All images are owned by ELLIS FAAS. never heard Ellis Faas before but she definitely sounds awesome! and her products too. will you show what you've purchased? i haven't tried that brand. ellis faas, heb ik zelf nog niet geprobeerd, maar wel van gehoord! Hahaha!! Funny! But hey, if you liken them to cattle, then these must be super highly paid cattle, no? Ja, het zijn naar mijn mening zeer stijlvolle producten. Kom maar eens terug om mijn ELLIS FAAS reviews te lezen. Just checked out the Ellis Faas site! Love it! Thanks for pointing out this line. Oh wow, that is a very interesting holder!